Updated March 2019. (G) used on some Idealliance G7® test forms. MAY NOT BE SOLD OR USED COMMERCIALLY unless indicated (read legal notice). Find out what your printer does with CMYK files. Also see how black ink and GCR can improve the color gamut of CMY inks. Convert this "RGB original.tif" image from the embedded profile to your working space, then try matching the included "CMYK via RGB.tif" image. Proves the benefits of RGB vs CMYK editing. Copyright © Don Hutcheson. May not be resold or published without written consent. 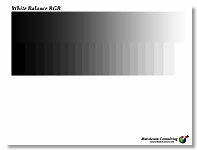 (G) A great visual gray balance test. The same B&W image in CMYK, K-only and CMY only adjusted for G7 gray balance. Updated April 2004 from the older (flipped) version to eliminate scum dots in the K-only image. An alternative to the GrayRails test in horizontal format. One B&W image in CMYK, K-only and CMY-only, adjusted for G7 gray balance. (G) Suggested G7 press bar. OK to edit or re-size. COPYRIGHT FREE. Used to visually confirm monitor or projector calibration. 48 bit, 4k, no embeddded profile. (G) Replaces P2P25 with true TR015 values and improved gray balance. Works with Curve2, Curve3 and Curve4. Includes P2P51H (horizontal), P2P53 (Indigo with .txt files) and miniP2P. (G) A handy Total Area Coverage target for analyzing the maximum ink tolerance of a CMYK device. A pretty standard target for finding the CMYK values that match a specific gray balance. Somewhat obsoleted by the P2P target (above). Check any source or destination profile for reversals, hue shifts etc. 24 radial HSB slices plus pastels, micro white & black & a continuous gray ramp. Check any RGB system for neutrality with this 256-step gray target. Also test if you really have 24 bit video. A new CMYK characterization target that improves results in darker regions compared to the IT8.7/4. Updated to version "F" May 2011. New User Guide July 2013. Unlike a plain gray field, this desktop pattern can't be mistaken for a window & alerts you to changes in monitor calibration. Check white and gray balance of your monitor and detect crossed curves introduced by calibration. Check consistency of any RGB printing system. Include alongside every RGB image and graph measurements on the PQM chart or just compare visually to a master print. (G) This RIP-killer has 256 discrete CMYK levels. Count or measure them. (G) Multi-level version of the GrayCal target with fine and coarse scales.